After six years of home ownership, my hallways and living room needed some touching up. We host parties with lots of guests. Our daughter plays with her toys. Two dogs run and play all day. It seems that “everyday living” in our home takes a toll on the walls, just as it does in homes all around the world. Over time, various nicks and spots and scuffs and streaks make their way onto the walls. The easiest fix is to simply paint over the imperfections and start the clock over until it’s time to touch up the walls again a few years down the line. The records we kept when the home was built indicated the name of the paint manufacturer and listed the color as “Canvas.” Simple enough…away I went to the paint store to order a gallon of “Canvas” in a flat finish. An hour later I was back home and ready to work. With brush in hand, I addressed all the hallmarks of a home well-loved and lived in. There were scuffs left by tricycle tires against the hallway walls when our daughter was learning to ride. A chip where I’d bumped the wall while moving a coffee table years ago. One after another, I touched up and repainted all the little spots that add up over time. And in a few places that were simply dirty, I cheated and painted over that as well (even though I know better). Content with my work, I left the paint to dry for a few hours before checking on each spot. Can you spot the mismatched touchup paint in this room? And it looked awful. The walls didn’t look like they’d been repainted or even touched up. Rather, it looked like someone had arbitrarily painted spots and streaks of a different color all around the house. A quick call to the paint store confirmed that the color “Canvas” hadn’t been changed and the mixture was right. As I was learning, greater forces than incorrectly mixed paint were at work with regard to my awful paint job. From the moment paint is completely cured, its color and sheen begin to change. If the quality of the paint and any topcoat is good, the change will go unseen for months or even years. But make no mistake: outside dirt, debris, and light will begin changing the coating’s color composition almost immediately. In high traffic areas or rooms with significant natural lighting, the change will be much more significant and it will happen much more quickly. There are certain ways to protect the coating to decelerate the damage. For example, a clear coat on an automobile is a great way to maintain and preserve the color of the automobile. Vehicles that are properly stored and cleaned can maintain their vibrant original finish for decades. But regardless of the effort made to keep the surface clean and reduce exposure to harmful sunlight, the change is happening right under your nose. Finding the perfect match requires much more than simply buying a new can of the same old paint. The reality is, given a long enough timeline, the original color of the the object won’t match the paint color the day it came out of the can. As a result, if you need to touch up an older paint job, then matching the color and sheen can be a significant challenge. Here are a few tips for matching a new can of paint to an existing color that has changed over time. A sample if at all possible. If at all possible, a paint sample from the exact surface you are wanting to touch-up is the best way to match the color exactly. Sometimes this is impossible without destroying the object (like a wall), but in cases of furniture or automobiles, it is possible to take the item to the paint store and work with a paint professional to get the color right. In industrial settings, it is often possible to remove a flake of paint from an existing structure. If that is a possibility, try to remove a sample that is at least two inches by two inches in size. If you can’t remove a sample, try to find a handheld spectrophotometer to help measure the paint color. Don’t be cheap. Cutting corners on a lower quality paint is unlikely to yield the results you are after. Spend a few more dollars on the right type of paint to increase the chance that the color matches correctly. Furthermore, using the same paint as was originally used can go a long way in getting the gloss of the final paint job to match the existing paint. Paint chemists at one manufacturing facility may be measuring gloss and haze to different standards than chemists at another manufacturer. Consult a professional. Many large retailers feature a paint counter. While the products they sell are often of high quality, that doesn’t mean the person helping you is skilled at color matching. Using a computerized paint mixer is great for new colors, but the expertise of a real paint professional can be a huge help when trying to match an older paint sample. If at all possible, find a commercial paint store that works exclusively with home builders, professional painters, and designers. The knowledge and expertise on color matching they have in-house will likely trump any other resources you can find. If you find a match, keep notes! If you find the right match for the client, make sure you take notes on how you arrived at the right paint composition. At some point in the future the client is likely to need the surface repainted yet again in much the same way. You can save yourself a lot of time and trouble by having a starting point to work with. 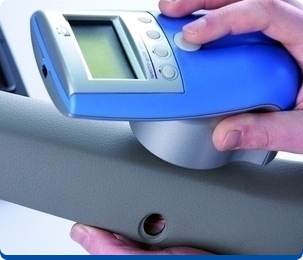 This spectrophotometer from BYK can help determine exact paint color if you can’t take a physical sample to the paint shop. Clients aren’t likely to understand the complexities of color matching old paint. While you certainly don’t need to educate them on the finer points of color match technology and the chemistry involved with creating paint colors, it is a good idea to make sure your client is aware that matching a new paint coat to an existing paint color is not as simple as just buying a new can of the old color. Let the client know that the best way to match colors exactly is to take a sample to a professional and that anything short of that is unlikely to yield an exact match. Follow the tips above and draw on your own experience to find the right match. Click here to learn more about color matching technology!